A sea blue, long, feminine dress made of medium thickness viscose fabric, which is very flexible and has a nice and chilly feel when touched. The top part of dress is fitted with a crossover slandering v-neckline. 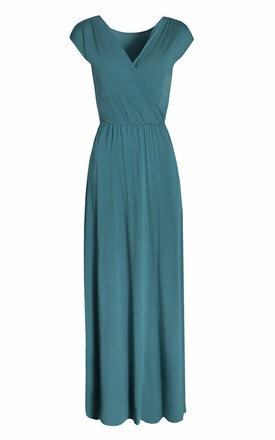 It has slim straps at the shoulders and elasticated waist and a slightly globed bottom. Skirt length (from the rubber to the hemline): 101-106cm.